How to layout an oval or true ellipse? There are a number of geometric methods but the fastest is the "pins and string" string method. Then the question becomes, How do I make the ellipse the size I want it? The answer is relatively simple but is not always right at our finger tips. 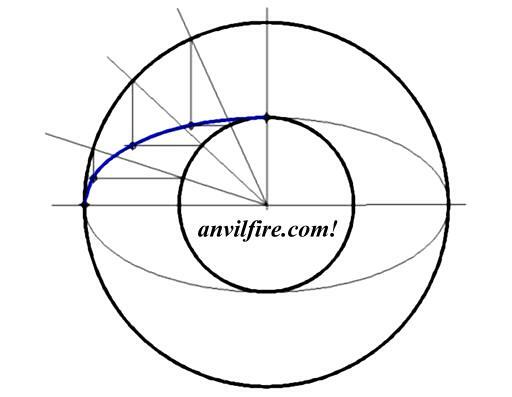 A major and minor circle are drawn to match the major and minor dimensions of the ellipse. Lines are drawn from the center out. These may be equally divided or not. Then descenders are drawn on the X and Y axis from where each of the radial line cross the circles. Where they meet is a point on an ellipse. This method is best done on a drawing board with squares or a drafting machine but some of us can do this freehand.